appear, but part of the ad is obscured on  the right. Minutiae (I may be getting a little too obsessed with this stuff), but there it is. signature as to who created the ad. I took a quick look through some of the ads and on March 15, 1985, SmileyGuy has 7 hairs. something else... also the shape of the ears seems to change a little. In later ads he has more earlobes. is an o. They eyes are two i. The ears might be o's or a d and a c. The hairs are... well I don't know. looks like a G. Hairs could me made into "hare" since they are pronounced the same. rest of the puzzle though (not that it's unique in that respect). clue:  Regarding: May Day, 1982. A few notes that seem pertinent to me. a ROT code (alpabet rotation... a ROT 1 (or -25) = b, a ROT -1 (or +25) = z) or other message modifier. 19 82 This seems much like other sets of "co-ordinates" that have been derived from other mesages. may be enough to know where the message is taken from. - Has anyone tried plotting any of these numbers on a cartesian plane (or using them as 3D references)? There are so many other possibilities. "lines" in it depending on interpretation & grouping of the extra stroke). Any stamp collectors out there? 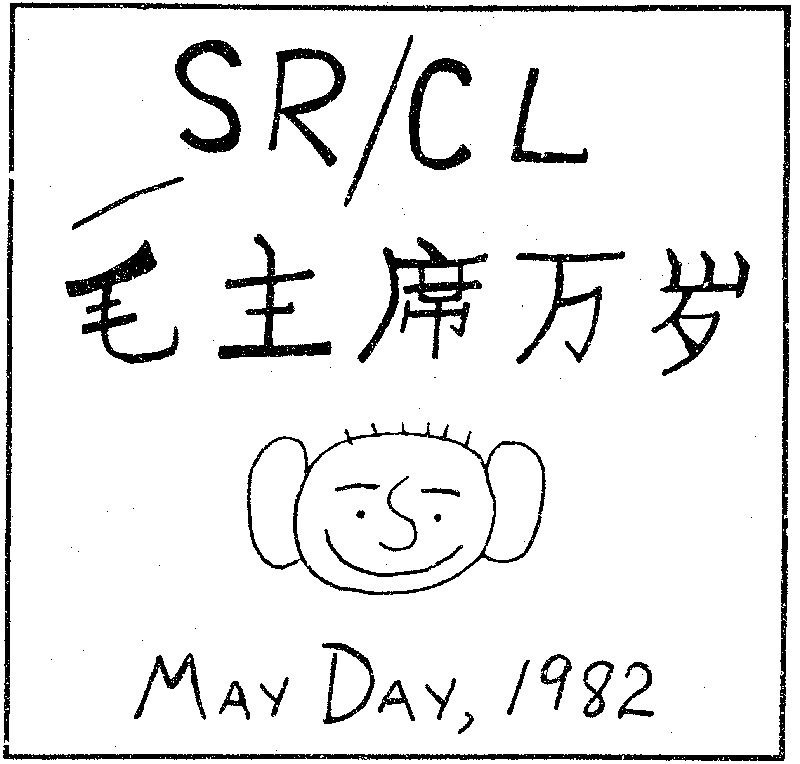 The postal service of China (whatever that's called) issued a stamp set on May 1, 1967.
mentioned before. I haven't checked the rest of the site. The smiley-faced man looks like a poorly drawn portrait of Mao himself. I think you are reading too much into the drawing. I don't believe the number of hairs makes a bit of difference. representation, but I don't recall how. This must have come from some child's puzzle I saw at an early age. already, but I just thought I'd point that out. got one or more of them to talk. key to the mystery somehow. Remember the Coordinates to tucson from the previous page? Go to the corresponding Page/paragraph/word in The BFG, Pre-May 1st edition? could it be that the face parts (nose, eyebrows, maybe mouth) form a kind of kanji? reminds me japanese fu (hu). The face is simultaneously awake and sleeping. Combined with the integration sign it seems to refer to the Hypnagogic mind state. Could also be referring to on and off simultaneously.. or TRUE AND FALSE which is a paradox. The very first transmission seems to sum it all up. system" or a type of representation of the self  and the godhead. induction due to certain natural transformations. * The "Mayday smiley also gives a clue"
The Smiley Face when stared at properly reveals "S O S" as in "Mayday"
it reveals the Vesica Pisces. The sign for integration is the figure's nose. the first transmission sums it up. There are other things that I do not feel comfortable discussing here. inevitably leads to the ability to anticipate the End Game. with this mystery. I will be adding clues as I find them.